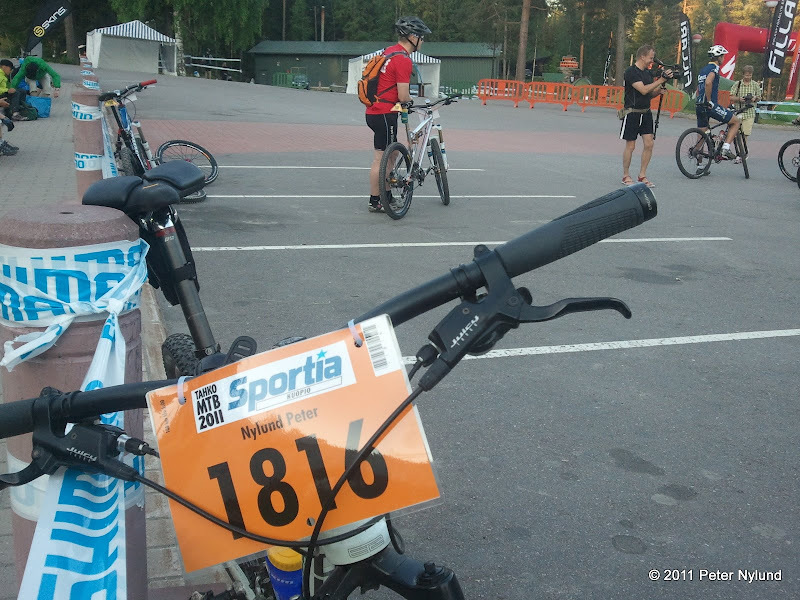 Tahko MTB is the largest mountain biking event in Finland. It is arranged every year the weekend after midsummer in Nilsiä in Eastern Finland. This year over 1800 mountain bikers attended. There are a number of classes to choose from and the full route is 60 km long. It consists of approximately one third roads, one third easy trails/doubletrack and one third real singletrack, of which only a small part can be described as technical. Most people ride one lap, but the longer alternatives are getting more popular. The longest course alternates between 180 km and 240 km every year. I chose the longest alternative, this year three laps and 180 km, having done the 120 km version twice. The 120 km version is usually considered a real test for a mountain biker, with the longest version being reserved for real athletes. I have no background in sports or athletics and being averagely gifted in this area, it was to be a real test for me. Still, though I have only been into these endurance things since 2007, I've never been a couch potato. I have ridden my bike to school and work for most of my life and I have also done some sort of exercise for my entire adult life. Last year I did two laps in a fairly good time, 7 h 49 min, and thought that a third lap would have been possible in a reasonable time, leaving the total at probably just under 13 h. Despite not getting to do the training I would have needed in May and June, I felt my fitness level was only slightly worse than last year, so I set 13 h as my target. When we got closer to the race, the temperature forecast went up and up, finally ending at over 30ºC (86ºF). Since I'm fairly big (192 cm / 99 kg), I use a lot of power when riding and therefore the high temperature would be a real problem to me. This forced me to redefine my goal to just getting through the ordeal safely. 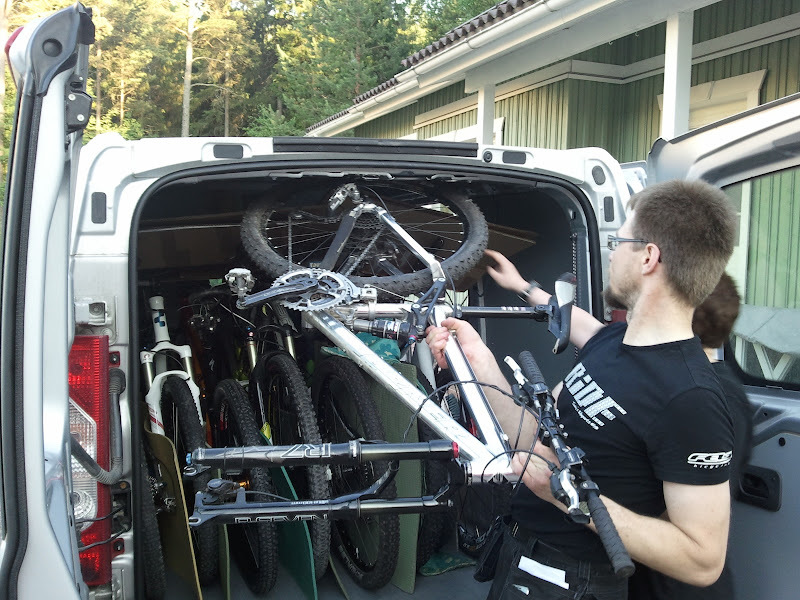 There were 14 of us from MTB-Turku sharing transportation and accomodation to Tahko, which is over 500 km from Turku. Nine bikes fit into Ulla's van. 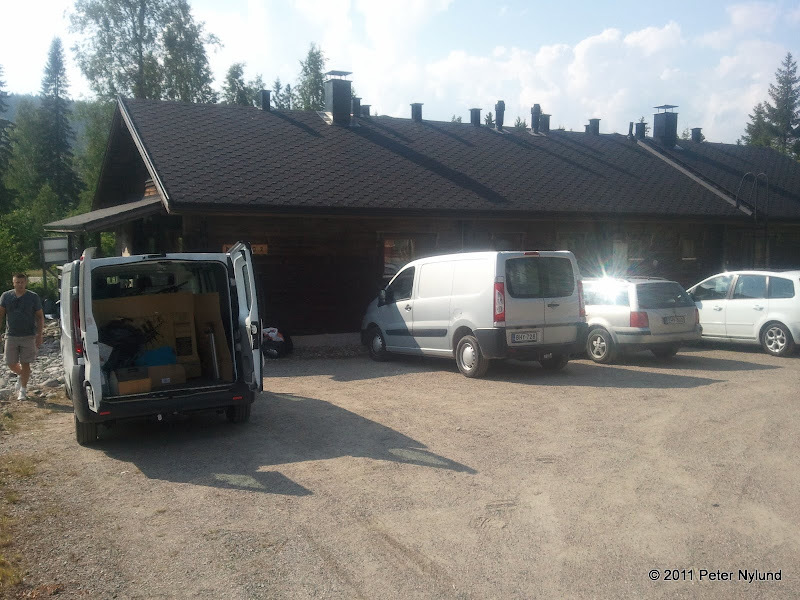 We arrived at the cottage early in the Friday evening and started to unpack the bikes and gear. At 04:00 in the Saturday morning the alarm clock woke me up. After a quick shower and a breakfast consisting of coffee and a few sandwiches I went to the starting point. The air was comfortably cool. There were 38 of us on the starting line for the 180 km ride, surely a new record. At 05:00 we started and the real athletes soon disappeared in front of me. I felt rather weak and the first dirt road part until the Kinahmi 1 climb was quite hard. Shortly after the climb I threw up, getting rid of my breakfast and an energy gel. Not a good beginning. However, shortly after this I started feeling better and the rest of the first lap went quite effortlessly in 3 h 51 min. In the beginning of the second lap I ate another energy gel, and immediately started feeling sick again. The first dirt road part was once again very hard. I really should try out the gels and get used to using them for events like this. At least the Dexal variant did not work for me. I managed to eat one more gel later, but during the rest of the ride my energy came from the sports drink, rye bread and cookies served at the check points. I don't think I got nearly enough energy from these, which affected my speed. On top of the Kinahmi hill there was lots of people riding in a tight queue, something which was poor use of my energy. My own riding technique is efficient enough so that I don´t have to brake all the time, but in the queue I was forced to brake and accelerate all the time. The temperature started to bother me and henceforth I stopped at every check point to pour cold water over me to get the body temperature down at least a little. It was up to 32ºC (89ºF) during the day. I did put some extra salt in my sports drink and I think I was able to drink as much liquid as the body could take in, about 12 liters during the day, which still was a lot less than I lost. Despite this I started to get cramps in the middle of the second lap and I had to walk the steeper climbs. On the trail sections the cramps did not bother me, probably since the muscles are used in a more versatile way when riding on trails. Following Matti H's advice, I regularly counted down from ten in German as a self check. Safety was the first priority for me. At one point I had some disturbance in my vision, and the self check revealed that not everything was in order. After a short rest and some drinking I felt good again and continued. The time after two laps was 8 h 46 min, not especially fast, but not totally hopeless either. Second lap, coming down from Kinahmi 1. My progress was slow due to energy deficiency and cramps, but I found no reason not to continue into the third and final lap. Even though I was tired and felt slightly nauseous, my riding technique and the bike worked perfectly. The technical parts went without problems and I felt completely safe continuing. I did not allow myself to question what I was doing during the first two laps, but in the beginning of the third one I asked myself if I felt smart doing this. I got no answer. The dirt road section was again hard, but on top of the Kinahmi hill it again felt good riding the trails. The almost vertical climb of Kinahmi 2 (totally impossible to ride) was very tough and I had to stop and rest in the middle of it, much to the joy of the gadflies. After this climb the trail went mostly downhill and was a joy to ride. The remaining road sections were hard, but I was able to enjoy the trail parts. 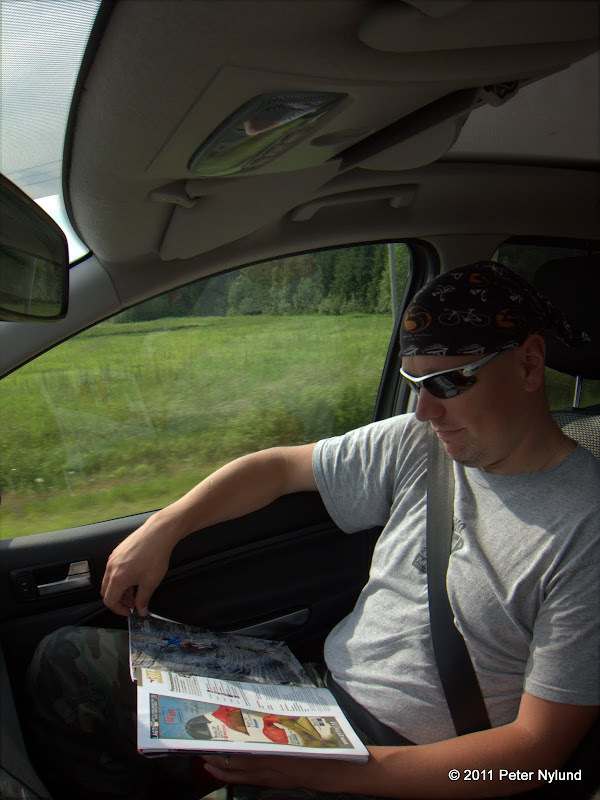 After the Tuulivaara check point I got my energy back, maybe because the end was less than two hours away. At the final El Grande climb the mosquitoes and gadflies were really angry when the crowd had disappeared and all focused their efforts on me. One final downhill section and a short flat part and I was done at 19:20 in the evening, after 14 h 20 min of riding, including maybe a half hour of breaks. I was not very fast, but I made it to the end safely and in these demanding conditions it was good enough. After the race I did not really feel anything more than relief. No real joy or even great satisfaction. It seems like the race was more demanding mentally than physically. Today (Monday) I finally started to feel some satisfaction of actually making it. A partial reason for this was also that it took a lot of mental effort to stay sharp when driving the car home on Sunday while being somewhat tired. I came back to the cottage, was congratulated by the others, drank a Coke (tasted heavenly), took a shower and fried some bacon before going to the pasta buffet. The bacon thing has been efficient at keeping the cramps at bay during the night following a very hard ride. It worked this time as well. During the evening we grilled sausages, ate, drank very moderate amounts of beer and contemplated the events of the day. Around midnight we went to sleep and more or less suffered through the night in the much too hot cottage. It was a relief when someone had forgotten to turn off the alarm clock, which sounded at 07:00. A shower and a long breakfast with several cups of coffee followed. After some more bike talk and glorious plans we started packing our gear and bikes. The temperature was 15ºC. It would have been an optimal temperature for the race. A little after eleven in the morning we started the drive back to Turku and after some seven hours the biking weekend was over. A big thanks to everybody in the MTB-Turku group! A final analysis: Despite rather poor training (totally unsystematic and somewhat insufficient), not bothering to learn to use gels and weighing a fair bit more than a true competitive athlete, I made it to the end. It should at least mean that I'm strong enough on the mental side, which does inspire some confidence. Should I find the motivation to train better and lose some weight, a notably better result should be possible.